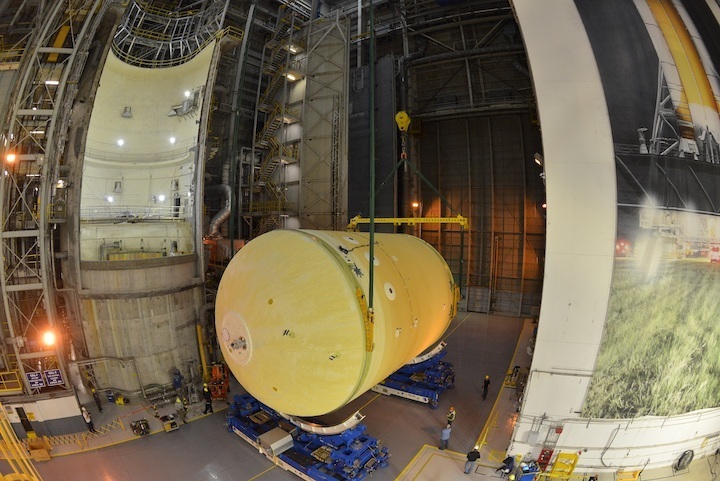 With completion of the three elements at the top of the stage, the forward skirt, the liquid oxygen (LOX) tank, and the intertank, Boeing was finally ready to put them together in Cell D of Building 110 at MAF just before Christmas. A Core Stage is composed of five major pieces, the three forward join elements, along with the liquid hydrogen (LH2) tank, and the engine section. Each of the forward join elements is the first working version of their kind, as opposed to qualification articles that are identical in structure only. The flight articles received an application of spray-on foam insulation (SOFI) on the outside; on the inside, the forward skirt and intertank were outfitted with propellant system components, avionics, wiring, sensors, and other equipment. A five-week long partial government shutdown complicated work arrangements on the eve of stacking operations, but beginning on January 3rd the top three sections of the stage were mated in a first for the program. “The same with the forward skirt, it was just as slick an operation as you could possibly imagine,” he added. Stacking the elements bottom to top, the intertank was loaded into Cell D first. 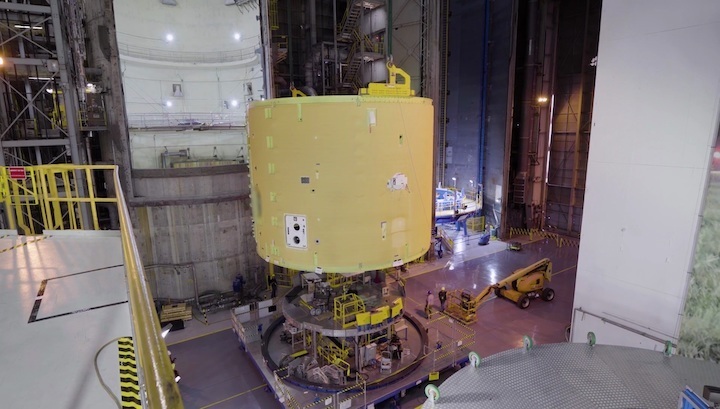 It was originally mounted in the cell on stanchions in mid-October, but was bumped from when completion of the LOX tank was delayed and it was decided to stack the LH2 tank structural test article (STA) while waiting. 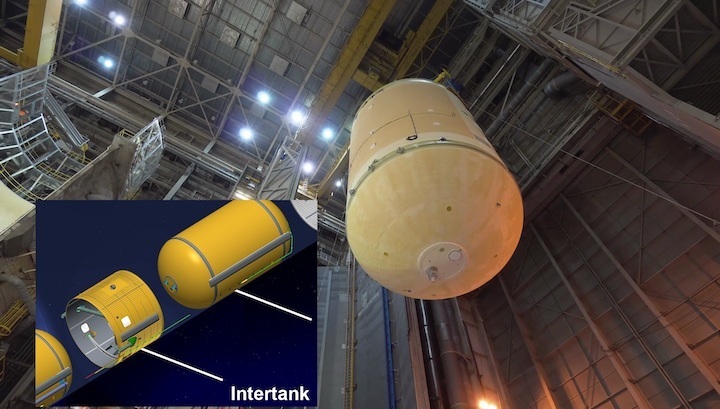 “The baseline plan was to move [the STA] over to D, but there was an intertank in the way, so we actually removed the intertank [from Cell D] for a short period of time,” Steven Ernst, Core Stage Engineering Support Manager for Boeing, noted in December. 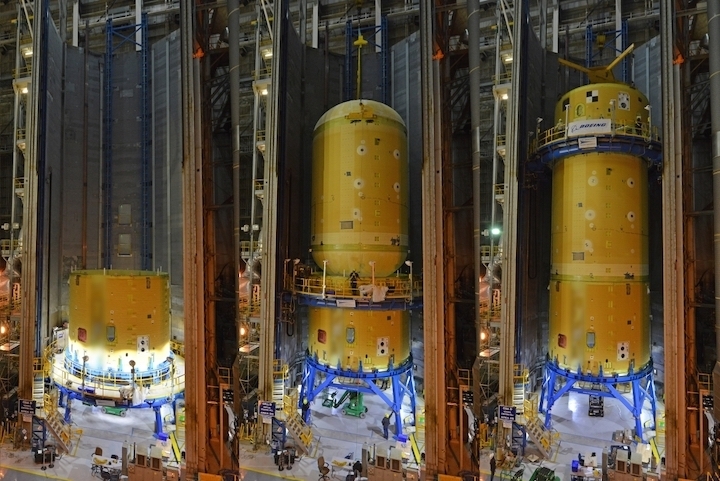 The three elements form the top half of Core Stage-1 (CS-1), the first flight article for SLS. 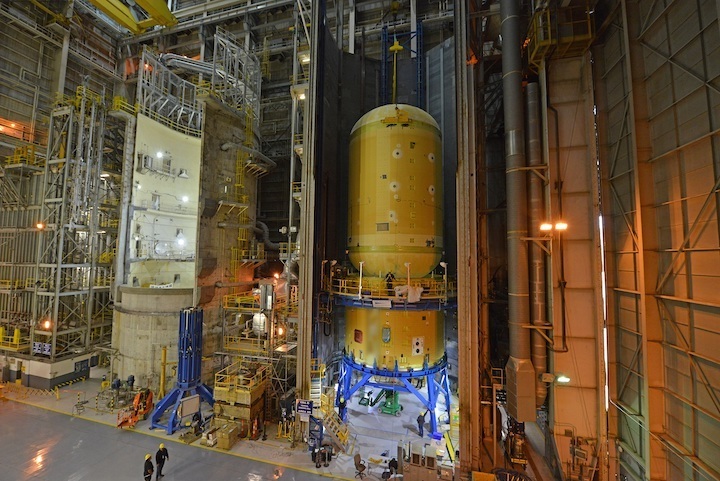 CS-1 will fly the first SLS launch of Exploration Mission-1 (EM-1), a test flight to send NASA’s Orion spacecraft on its first solo flight to lunar orbit. CS-1 is not only the first flight article, but the first working Core Stage, so it will first be used for the Green Run test campaign at the Stennis Space Center in Mississippi before transport to the Kennedy Space Center in Florida for first launch preparations. Schedules for the EM-1 launch remain tentative, but forecasts have it some time in the second half of 2020, more likely towards the latter end of the year. 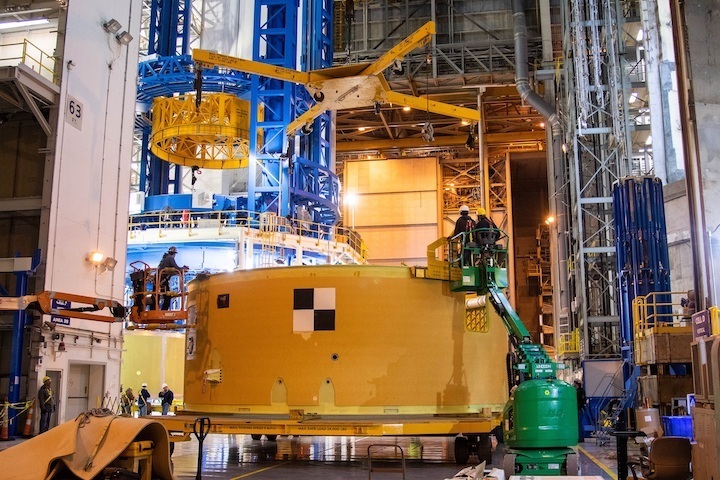 Final standalone work on the LOX tank was completed a few days before Christmas while it was mounted horizontally on a pair of Rotational Assembly and Transportation Tools (RATT) in Area 6 in Building 103. Boeing’s “indoor” Manufacturing, Assembly, and Operations (MAO) Self-Propelled Modular Transporters (SPMT) rolled the RATTs holding the tank a couple of doors down to the adjoining Building 110. 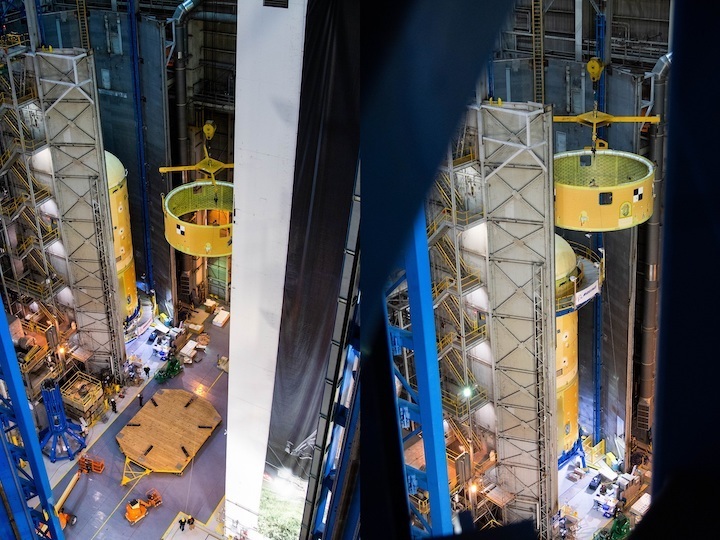 Also called the Vertical Assembly Building (VAB), Building 110 is now repurposed for SLS Core Stage production, including the Vertical Assembly Center (VAC) welding tool, and two vertical stacking cells. Cell A was originally configured for vertical stacking when Building 110 was initially constructed over 50 years ago to stack the S-IC first stage of the Saturn V launch vehicle; it has several work platforms at fixed levels. 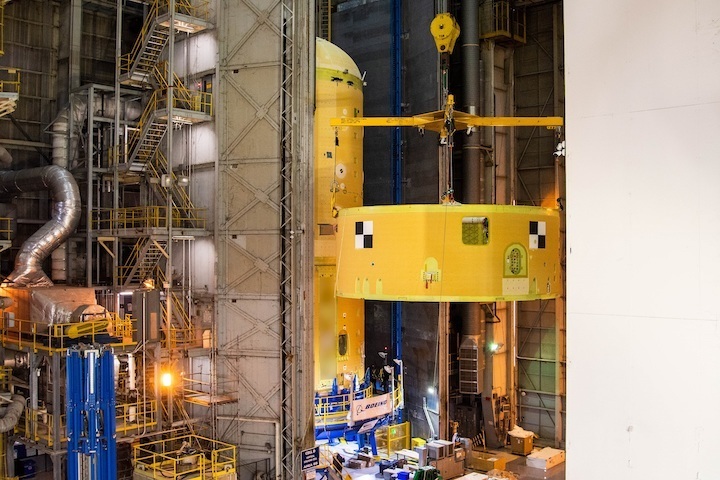 Cell D was converted into an integration cell for SLS after the Space Shuttle Program and has a single, movable platform that can provide access up and down the cell. The tank is attached to the RATTs by two roll rings that grip the flanges on either end. The RATT system is used for several work items while the tank is horizontal, including application of the spray-on foam insulation (SOFI) for thermal protection and, before that, a coat of primer for corrosion protection. The SPMTs set the RATTs with the tank down in the aisleway for the lifting and mating work. “There are three sets of roll rings, so [we] rotate it to a specific position and then we’ll have this third of a section sitting [underneath],” Ernst explained. The two cranes break-over the tank from horizontal to vertical, where the crane attached to the lower end is disconnected. The other crane then finished lifting the LOX tank up into Cell D and lowered it down to the intertank so that the bottom flange on the LOX tank met the top flange on the intertank. The three forward join elements have flanges at both ends where structural rings are integrated into the structure and provide a mating surface to join each pair of elements. Hundreds of bolts around the circumference hold each flange together. 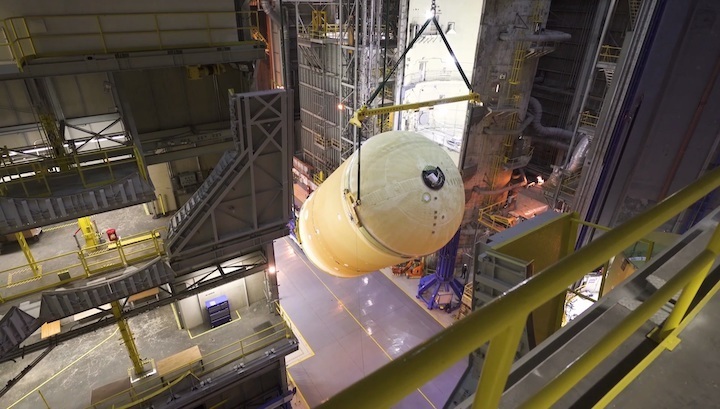 On January 14, the forward skirt was lifted off its transportation carrier in the Building 110 aisle, up into Cell D, and lowered down on the top of the LOX tank. The element was the first of the five major pieces of the stage to be completed in July. Similar to the first element stacking, the bottom flange on the forward skirt was lined up with the top flange of the LOX tank and bolts were torqued to mate them together. The LOX tank was the last of the three forward join elements completed. SOFI applications in Cell N were completed in June, and it was moved to Area 6 on June 20 where it needed installation of assemblies inside and outside to get it ready to stack. A series of “sensor islands” for development flight instrumentation (DFI) needed to be completed, a sensor mast assembly had to be put inside the tank, and the sump at the aft end needed to be installed. The sump install has to be done with the LOX tank in a vertical orientation, so the original plan was to do that at the end of the sequence; however, a procurement issue delayed sensor mast readiness. Although requiring an extra set of moves, breakovers, and lifts, the sump install work was moved up in the sequence, the LOX tank was moved to Cell A, and installation was completed in August. The internal sensor mast was installed in the tank in October. “The sensor mast goes inside the tank and includes all the depletion sensors and propellant level sensors [and] there’s some thermal sensors on there,” Ernst noted. The sensors are part of the Cryogenic Level Sensing System (CLSS) that is used to pace loading of the two propellant tanks on the ground and let the vehicle computers know when it is about to run out of fuel in-flight. “There are [sensors] in the sump and those run to a connector plate that’s on the sump and then the other run of the sensor mast runs from about that first weld seam and goes to a connector plate on the forward end of the tank,” Ernst added. The diffuser is located on the inside of the forward manhole cover; once it was installed, the cover could go on the tank and be closed out, with the Redundant Inertial Navigation Unit (RINU) now installed there on the outside of the cover. The systems tunnel houses power and data cabling to connect all the stage’s computer and other electrical equipment in different parts of the stage. It spans almost the full length of the stage on the -Z side, starting from the forward skirt and running down the LOX tank, intertank, liquid hydrogen (LH2) tank, and ending with the engine section. Foam closeouts of the sump were one of the last work items completed before the work platforms were retracted for the move to Cell D. Prior to that, finishing foam sprays of the DFI sensor islands were completed. The circular islands are spread out in different locations on the skin of the tank barrel, with wiring runs to integrate them with data acquisition systems on the rocket. The intertank is the most intricate of the forward join pieces. “It has twenty-six different avionics boxes, it’s got seven flight cameras inside of it, over two-hundred sensors that are used to determine how the intertank performs before we put a crew on the vehicle, one-hundred thirty-five cable harnesses, one-hundred twenty feet of ducting, haz gas (hazardous gas detection) systems, hydrogen systems, liquid oxygen systems, so it’s a very complex piece of structure,” Shannon said in an October 3 media teleconference. At that teleconference, Shannon noted that functional testing of the intertank had just been completed and NASA and Boeing were in the middle of the final reviews of the results to give concurrence to disconnect all the test equipment and get the element ready to move to Cell D. The move from Area 55 in Building 103 occurred in mid-October, with the first lift into Cell D occurring on October 16. At the top of the forward join stack, the forward skirt structure connects the Core Stage to the upper part of the launch vehicle. 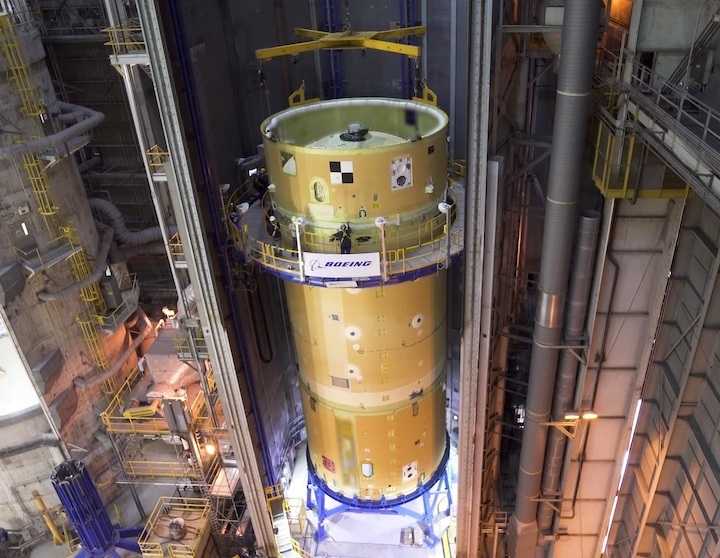 For the SLS Block 1 configuration, the Launch Vehicle Stage Adapter (LVSA) connects the Interim Cryogenic Propulsion Stage (ICPS) at the top with the forward skirt. After all the wiring and equipment was installed, technicians performed functional testing of the forward skirt to verify that everything behaved as specified. Testing wrapped up at the beginning of July and following some additional work such as painting photogrammetry markings at different locations around the circumference, the forward skirt was complete and waited to go on top of the stage. The avionics equipment includes the three flight computers which are located there for the Block 1 configuration. The RINU was moved from the forward skirt to the top of the LOX tank on the manhole cover for the forward dome. The flight computers use information from the RINU for vehicle guidance navigation and control (GNC). One of two Command and Telemetry Controllers (CTC) is also located on the forward skirt, along with environmental control ducting. Although bolting of the elements physically mates them, each plays a role in a working rocket stage, and all the equipment must work together to reach the right place at the right speed when the stage’s four Aerojet Rocketdyne RS-25 engines shutdown. 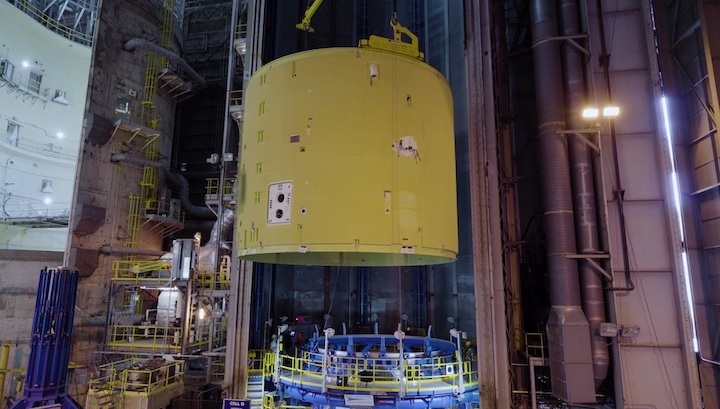 The next major task of the forward join was to install the tops of the two large LOX feedlines that supply the oxidizer from the LOX tank to the RS-25 engines at the bottom of the stage. 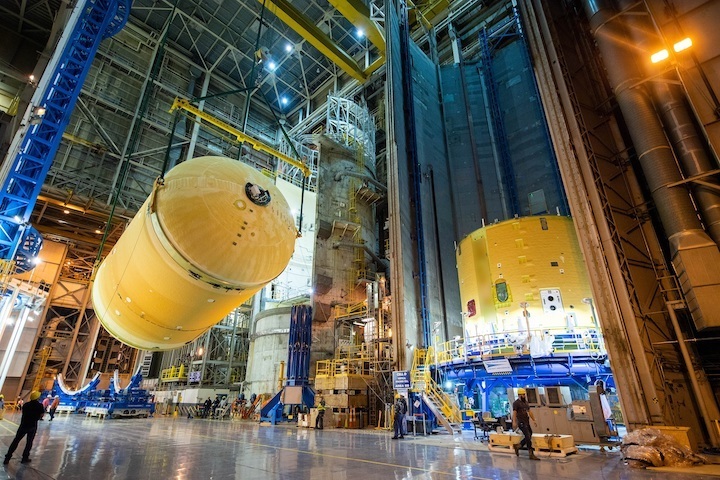 “We mount two very large S-ducts coming out of the bottom of that LOX tank and then they’ll exit through the intertank to form the very upper part of the downcomers that bring the liquid oxygen down to [the] engine section,” Shannon said. The now bolted flanges were left bare except for a coat of primer paint for corrosion protection until they were mated. Another major task is to cover those flanges with spray-on foam insulation (SOFI). The wiring that runs throughout each of the elements and the sensors taking measurements in key locations throughout the stage will eventually be connected together with avionics boxes and to the computers in the forward skirt. Several cameras will also be mounted in the intertank for the Green Run tests. “For Green Run we’re real interested in seeing how well the LOX sump performs as well as just the general environment and the forward cover of the LH2 tank,” Ernst said. In addition to the DFI islands on the skin of the LOX tank, ground test accelerometers and wiring are also attached in several spots to the outside of the tank with clips for the wiring that are temporarily embedded into the surface of the acreage foam. “We came in and laser shot all the locations for accelerometers and…we spot face the foam to get a nice, clean surface,” he noted. After the Green Run testing is complete, the ground test instrumentation and clips will be removed.